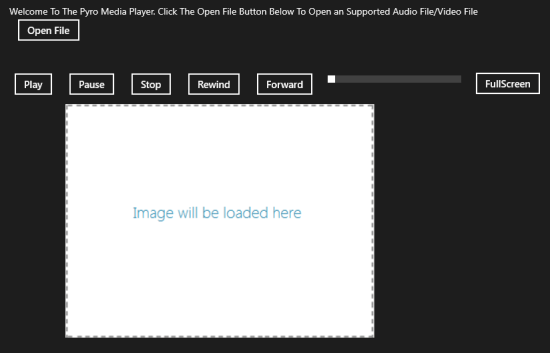 Pyro Media Player for Windows 8 that lets you play multimedia files in MP3, MP4, WMA, and WMV formats. That might appear a pinch of support, but totally justifiable on looking at its minimal resource consumption. In addition, it delivers you the option for easy rewind and fast forwarding. 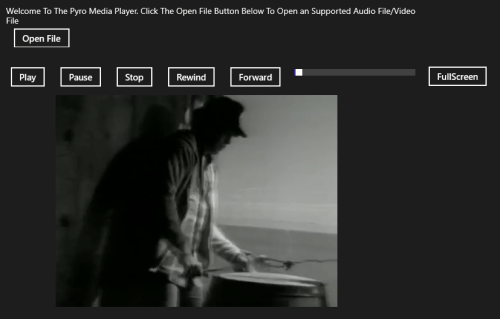 On launching Pyro Windows 8 Media Player, you will be presented an interface with multiple buttons at top and a blank region beneath. The foremost thing would be to open a supported multimedia file on your Windows 8 machine. You can begin with a click on ‘Open File’ button placed on the top-left section. Soon after clicking you will be redirected to a window for locating the folders with supported multimedia content. Then, you require clicking on particular file, followed a click on ‘Open File’ button at bottom-right. Next, the playback will begin and you will be able to try different options. Just a click on appropriate button will be sufficient to pause, play, stop, rewind, and forward the playback. You can play or pause at any moment while forwarding or rewinding. You can also utilize the playback slider as per requirement. Pyro Media Player also supports audio-video playback in full screen. To start watching the video in full screen you can click on ‘FullScreen’ button on the right most end. To exit, you will have to right-click on the screen and select ‘Exit FullScreen’ button on the top-left corner. You can open only one media file at time using Pyro Media Player for Windows 8. It works fine with video files in supported formats. Anyhow, when it comes about playing MP3 files then you might experience some strange behavior. (Specially, when forwarding or rewinding). You will not be able to access other options while in Full-screen mode. To install Pyro Media Player for Windows 8 you will require opening following link in supported web browser such as IE 10 or later. 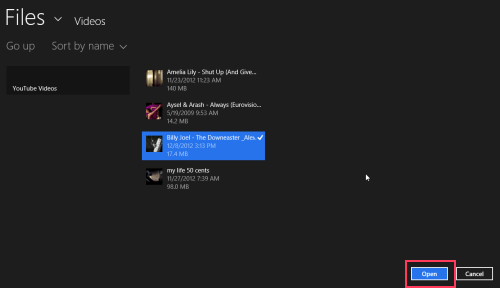 Then click on ‘View in Windows Store’ button and then click on ‘Install’ button in next Window. Pyro Media Player For Windows 8 is probably not the best, but if you are looking for an easy and lightweight solution then it is definitely the option to go for.